No, this isn’t an entry about breakfast cereal. It’s about skinny-water fishing on the Chesapeake Bay where conditions are perfect for the snap, crackle, and pop of topwater lures. That’s the good news. The bad news is that muddy water has all but eliminated fishing in the main stem of the Bay. The tributary rivers are clearing, but water in the main channel remains deeply stained. Satellite photos show a sediment plume stretching all the way down to the mouth of the Patuxent River. It’s too trashy to troll, too muddy to catch bait, and too dirty to bottom fish. Thank goodness for the versatility of light tackle! While many anglers are sitting on their hands lamenting the impossible conditions, light tackle fishermen are enjoying a banner fall. Since the shallow-water bite is tasty, I thought it might be interesting to look at three basics premises of topwater casting – let’s call ’em snap, crackle, and pop. Snap – That’s the action to put in your rod tip when you’re casting a spook-type topwater plug. Spooks are usually the first lure out of my box in calm water, like when I’m fishing in the lee of a rocky point or in the shelter of a narrow river. Modern spook-type lures are designed to be relatively easy to use, but it takes a little practice to get the best response out of them. The basic technique is a rhythmic, slack-line retrieve that makes the lure walk back and forth, alternately left and right. 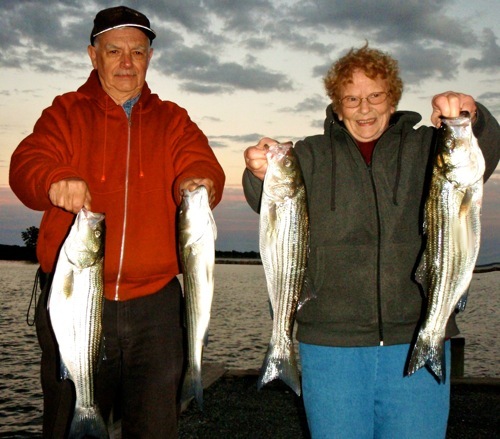 That action is called walking-the-dog, although it might better be called walking-the-fish since stripers find it irresistible. To effectively walk-the-dog, start by standing close to the side of the boat with your rod tip pointed steeply down toward the water. 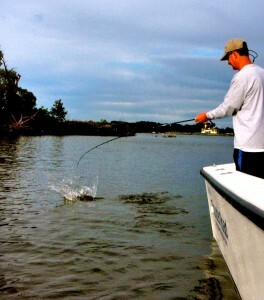 Reel in the slack, then use your wrist to snap the rod tip down and toward your feet in short, rhythmic pulls. Let you line go slack, then repeat. Each subsequent snap should be done on a slack line, using the wrist only. Experiment with the length of each pull, along with the cadence, to determine the distance the lure travels on each glide. Sometimes the fish prefer a very fast walking lure, while at other times they want one that slides from side to side very slowly. 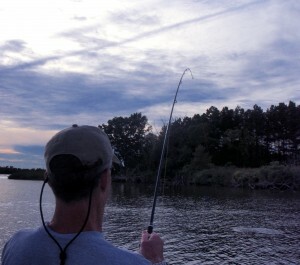 When fished correctly, a spook will leave a long wake. This wake, in combination with the length of the plug, simulates the irresistible appeal of an eel, snake, or needlefish swimming through the water. Crackle – If you’ve picked up a top-water plug off a bait shop shelf recently, you’ve probably noticed that it made a racket. Most fishermen realize that lure noise attracts fish. Need proof? Drop a marble or small stone into an aquarium. The fish will startle and bolt away, then immediately return to investigate the source of the noise. Taking it a step further, fish hatcheries in Japan have invented a technique whereby a rhythmic sound is played every time they feed their young fish. Once the fish are old enough, they are released into wild streams to grow. Once they get big enough to eat, the farmers simply go out to the streams, play the sound, and wait for the fish to fill up their waiting nets. Rockfish have lateral lines that sense vibrations in the water. Sound travels five times faster through water than it does through air. In certain conditions, noise is the only thing a fish will pick up on. The more of a crackle your lure makes, the more attracted the fish will be to it. Some lure manufacturers offer topwater plugs in low-pitch and high-pitch varieties. Since bass sounds travel for longer distances through water, I usually opt for the low-pitch variety. When I’m looking at brands that don’t offer a choice, I still pick the plugs up and shake them to select the ones with the lowest pitched crackle. Pop – Poppers (also called chuggers) have a flat or concave face that forces water up and out. This results in a significant splash coupled with a gurgling or popping sound. Most baitfish will rush to the surface when under attack from predators, at times even jumping clear out of the water to avoid being eaten. 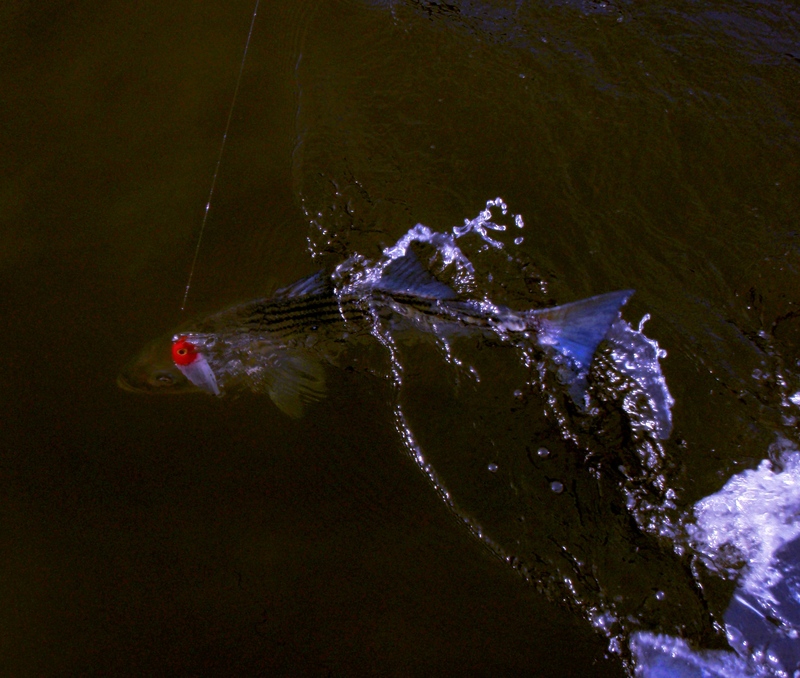 This panic type action is simulated by poppers, making them attractive to wary gamefish, even in shallow, clear water. 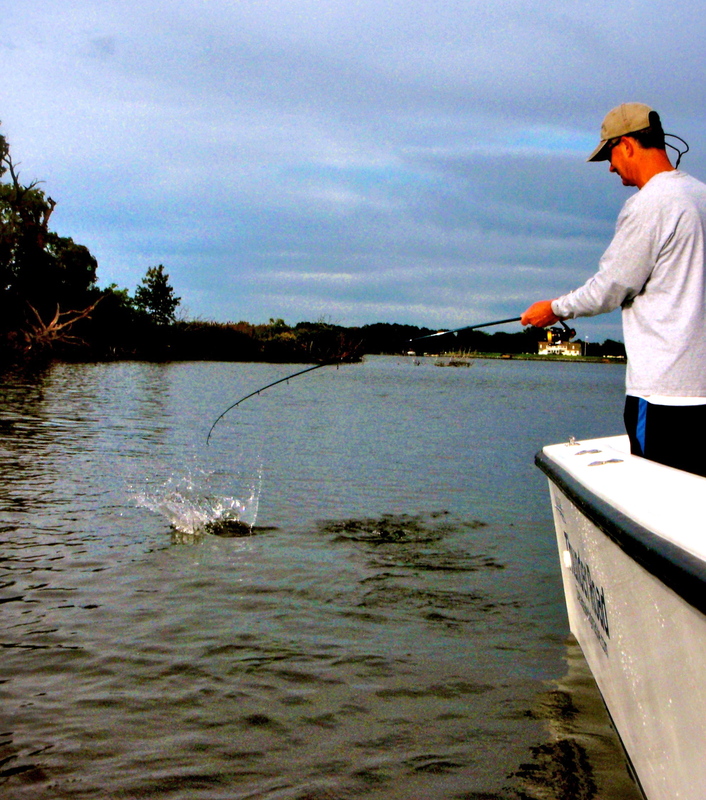 Poppers are best when fish are feeding aggressively, or in windy conditions. They can be worked very slowly with short snaps, or quickly with sharp twitches while constantly reeling. They can also be fished with a “do nothing” method. In other words, just let them sit on the water and give it a pop every 15 or 20 seconds. This allows spooked fish to return and investigate, just like they do when you drop a marble into an aquarium. My usual technique is to fish them very aggressively, then slow down if I don’t get strikes. The splashing sound poppers create can call fish in from a distance which is even more helpful when the water is choppy or muddy. According to one lure manufacturer, topwater lures should come with a warning: This product is known to cause increased heart rate, sweaty palms, trembling limbs and in some cases, heart attack. That’s the excitement of topwater fishing. One minute your lure is plop-plopping back toward the boat and the next moment it explodes like a charge of dynamite. Topwater lures are also great for beginning anglers because they can see, hear, and feel the strike. I’ve fished frequently over the past few days, always in the evenings and almost exclusively with top-water. Avoiding the muddy mess in the main channel, I’ve concentrated on the Eastern Shore rivers. 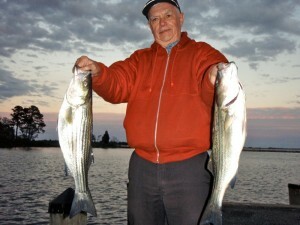 Most of my fishing has been with my mother- and father-in-law, who were visiting from Drummond Island, Michigan. I also got out for a couple of hours one afternoon with my fishing buddy, Mark. 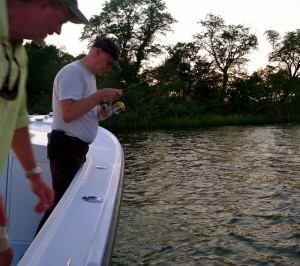 We found a few fish in open water, but most of the time we were casting to places that are very shallow. Sometimes the fish are in water so skinny that, in order to get to them, I have to trim the 225 Honda outboard on my Judge 27cc Thunder Road up like a go-devil. I’ve had to get out and push the boat off a shallow spot or two, but I know these areas very well so I’ve been careful to avoid hidden rocks and snags. The essential ingredient for finding fish right now is moving water around points, jetties, docks, and snags. I look hard for subtle rips. Sometimes, the only thing that gives away a good fishing spot is a change in the way the waves ripple on the surface of the water. 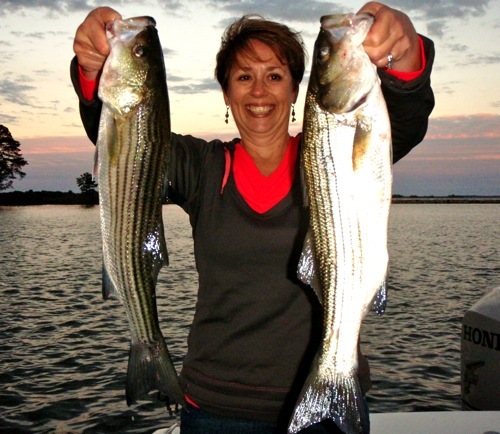 This time of year, a rip near a point with deeper water nearby is a guaranteed good fishing spot. We easily caught a limit of keeper-sized rockfish on every outing. Hot lures are Bomber spooks, Heddon Super Spooks, Stillwater Smackits, and MirrorLure Top Dogs. Best colors are contrasting reds and whites but chartreuse and blue has also been effective. Casting to shallow structure with top-water lures is as fun as it gets. I’d rather catch one fish on a top-water plug than a dozen on another bait. There’s nothing more satisfying than that jolt of adrenalin you get when a big striper surprises you by exploding on your surface lure. So don’t just sit there on your hands waiting for the water to clear. There’s another game on the Chesapeake Bay, and all you need in order to join the fun is a light tackle outfit and some lures that snap, crackle and pop. another fine read…that is a similsr pattern that worked for Tim and last weekend… although in the bright light of mid=morning the bite turned to sub-surface… Thanks for all the info! Are you sure about this? It strikes me as very risky to be out on the Bay right now. Lawrence he isn’t on the Bay if you can read. Shawn I want to thank you for the information from last week. I live near St. Michaels and you motivated me to go down to the water and cast the only chug bug I own. I caught a nice fish on my second cast. I almost couldn’t believe it. My wife actually didn’t believe it so I went out again and caught two more in the same place and brought one home for dinner. I went back tonight and didn’t catch any but I noticed the tide wasn’t moving and thought ah ha, thats just what you said. Now I think I need to learn how to read some time charts and buy some more lures. I might be getting hooked. Good article. You weren’t kidding about the shallow water bite. I tried Eastern Bay on Sunday late afternoon, hoping to catch a few flyfishing with a pencil popper. Just for laughs I tied on a Magnum Zara Spook on a spinning rod and started throwing it when a breeze kicked up. A few blow-ups later, and I’m hooked on the Zara Spook. The lure is enormous, too big for the outfit I’m using. I kind of lob it to the target and it makes a great big splash when it lands, but after that it is pretty quiet through the walk-the-dog routine. Then comes the explosion. I caught several large fish Sunday (to 28″, which is large by my standards) and then came back Monday and had similar results (but slightly smaller). Also, on Monday I learned that snapper blues have no problem with attacking a lure that is larger than they are. The other thing I found is that big rockfish have trouble fighting when they’re hooked in very shallow water. It’s a very splashy affair, but they can’t get the momentum to put up much of a tug of war, which is not necessarily a bad thing. Just good fun. 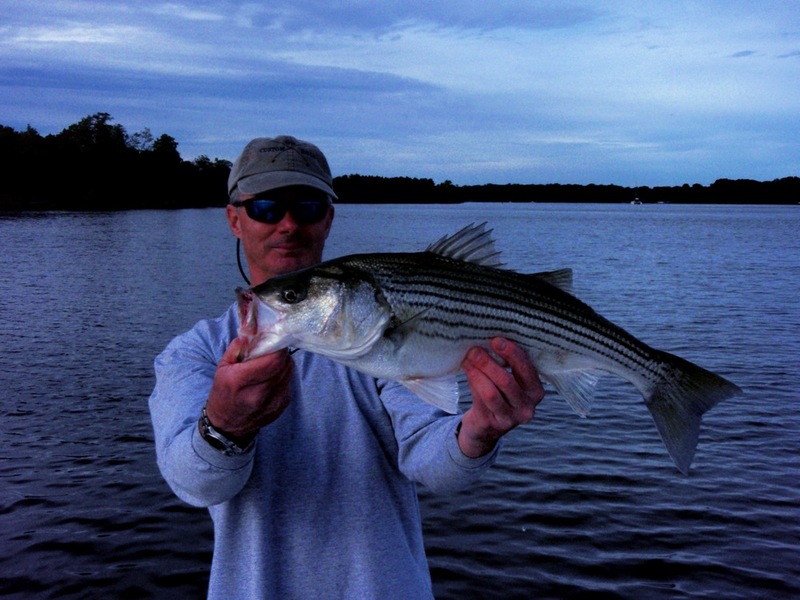 I fished the upper chester river this week with good results around deep points. Top water is the trick. I have a friend who lives on the wye and he says it’s good right now too. Do you think that the rivers on the western side will be as good as those on the east? We’ll go east if we have to , but negotiating all those big logs made me a little nervous. My boat will be ready next week, and so will I. I look at those spooks and Storm poppers on my rods every time I go in the house and I just salivate. The sooner that it is out of the shop, the better. Thanks for posting another educational report. Nice report Shawn. Now thru Jan is my favorite time on the bay, other than Mar&April on the flats. 2nd verse same as the 1st. Shawn,check out the Tsunami Talkin Popper’s have low pitch to um.You can pop um like a regular plug and work it like a spook too,pretty versatile TW bait that cast a mile. Great report as always and I’m with Steve—when is the book coming out? I second the Tsunami Talkers and I really like a super spook worked very slowly in calm water sometimes. Good report, Kimbro. I noticed you stopped and check out some little bluefish we were chasing at the mouth of the Miles last weekend. Has there been anything good happening in Ebay? Thank you for the comments. This was a fun report to write. The book is on the way. It’s actually been finished since May, but I got sidetracked with a publishing company and got bogged down in negotiations and trying to decide if I want to sign my life away. Of course, I’ve learned more over the summer, so had to update again and I’m hoping to have it out very soon. I will have to check out those Tsunami lures. As for the Western Shore rivers, they’ve been good in years past, but the dirty water has closed them out so bait can’t get in, so they’re off this fall. I really like the success stories you guys posted. That’s what makes it all worth it! Did you see my question abot Ebay? Ebay? Isn’t that an internet auction site? Ha ha that is all I need to know. Western shore rivers have been ok. There is some clean water further back. Having fun finding some new topwater spots that I have never tried in years past. Usually fish the mouths and Eastern Shore this time of year. They like that red and white spook! Just to clarify my terminology, I call any lure that is designed to slide or walk back and forth a spook. Any lure that splashes water forward and up is a chugger/popper. For example, a Stillwater Smackit is a chugger, but some pencil poppers are really a spooks. Or, a Chugbug is a popper, but a Top Dog is a spook. Confused yet? In the freshwater bass fishing world, lures are classified on their action and not their trade names. Splashy plugs are chuggers, slidey plugs are spooks. There is another topwater plug variation as well, it’s called a stick bait, slash bait, or jerk bait. It’s a long thin lure that neither walks nor chugs but floats and usually has a lip that gives it action. They’re fished on the surface or just below and are absolutely killer in spring on the Susquehanna Flats. Some stickbaits have propellors and are designed to throw up water on the surface, some don’t. A good example of this type is the shallow version of a Rapala X-Rap or even a classic floating Rapala. BUT, Rapala also makes an X-Rap Walk that is actually a spook and other X-Raps that dive deep. So, bottom line, it’s better to generalize based on the action since the names are so confusing. Next spring I’ll try to do a CLT entry illustrating the action of the different types of topwater lures.